As a woman in my 40s, I understand and appreciate the challenges that others in my age group face. Our waist lines want to expand even when we exercise and are careful with our nutrition. Yes, you read it right. If all you do on your treadmill (or any cardio machine) is long, slow, monotonous sessions, stop it! Sell your treadmill and make room in your house and life for some really effective fat burning exercise. And you don’t need to spend a lot of money! Your GOAL is to add muscle to your body. Muscle is active, calorie burning tissue that helps keep your metabolism going strong. 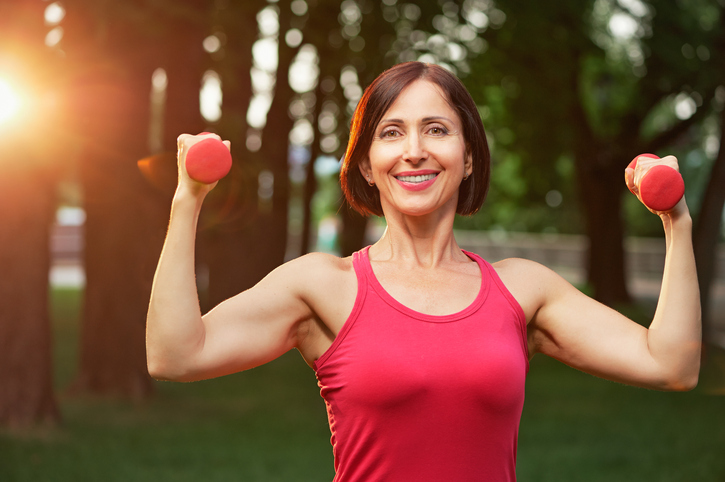 The reason why many women in this age group are gaining weight while eating the same quantity of food is that they’ve lost some lean muscle mass due to a more sedentary lifestyle. The mid section is always a trouble spot for women in their forties. There is no magic bullet for this area, but the PLANK is one of the most effective exercises that you can safely perform to tone the abdominals. It effectively targets the abdominal area, and is much safer and easier to learn to perform than crunches. Having a strong core will reduce back aches and improve posture as well.